PTP Constructors, a JV of Schiavone/Shea/Skanska, has chosen an 8.38m diameter Robbins Main Beam TBM to excavate the twin 1.6km long Palisades tunnels in New York, the first rail route to be constructed under the River Hudson in 100 years. Boring is due to begin in Autumn 2011 on the New Jersey portion of the US$8.7bn Access to the Region’s Core (ARC) project stretching from North Bergen, New Jersey to Manhattan in New York City. Due to go online in 2020, the ARC tunnels comprise the largest transit infrastructure project under construction in the U.S. The High Performance (HP) TBM will be mounted with 19-inch diameter cutters for decreased cutter changes and faster penetration rates in the hard rock that consists primarily of diabase with some sandstone and siltstone at strengths of 125 – 300MPa. The retractable TBM design will be similar to that of the Robbins Main Beam successfully used at New York’s East Side Access project. 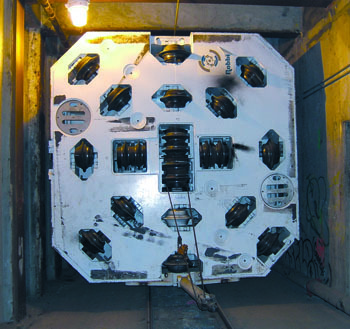 Hydraulic side, roof, and cutterhead supports combined with a bolted cutterhead design will enable the TBM to be backed through the bored tunnel past temporary ground support. Manufacturing will take place at the Robbins Solon Ohio, USA facility, and the TBM will be shipped to the jobsite by early July 2011. New Jersey Transit’s ARC Tunnels, when complete, will consist of parallel 5.8km long tunnels passing under the Hudson River and terminating in Manhattan near the existing Penn Station. Separate contracts were tendered for soft ground tunnelling below the Hudson, as well as hard rock tunnels and cavern construction in Manhattan. Once complete, the new rail line will double peak capacity of the metro system, which has not built a new trans-Hudson tunnel since 1910. Ridership between New York and New Jersey has quadrupled since 1984, and is forecast to double again over the next two decades.